On 13 June 2017 the districts of Bandarban, Chittagong, Rangamati, Khagrachari and Cox’s Bazaar in Bangladesh suffered from possibly the deadliest landslides in their history. The landslides killed at least 160 people, 187 people were injured and 6,000 homes were destroyed, along with other key infrastructure. 80,0000 people have been affected across the five districts. Among them 42,000 have lost their houses, belongings, livelihoods and food stocks. World Vision Bangladesh received a Start Fund award to provide 100 households with shelter support. 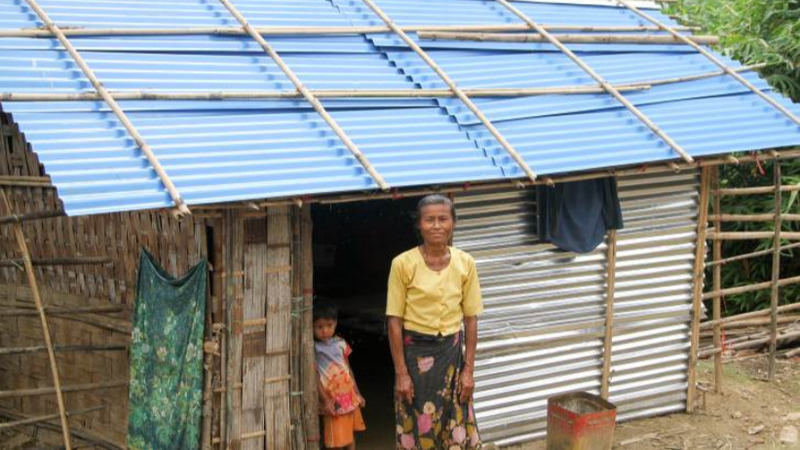 Each received 16 corrugated iron sheets with a one-off cash payment or shelter construction. In addition, we’ve supported 783 families with cash to repair damaged homes and buy food. All 883 households also received hygiene kits. Economic empowerment: The cash families received empowered them to meet their own individual needs. Each household also now has a mobile bank and mobile SIM card, that they can use again in the future. Build back better: Houses have been rebuilt and repaired. They’re much stronger now, and new homes have been built in safer places, so children can be better protected from future disasters. Networks: Everyone we helped was registered with a phone network and given a SIM card. This meant they could be contacted and supported at any time throughout the disaster - and this could provide a lifeline in future emergencies. This SIM card was also linked to their own bank account and used for cash transfers. Ma Mya Marma is from one of the affected communities . Her house was completely destroyed by the landslide. "It wouldn’t be possible for me to rebuild my house, but this support has helped me to build my home"
Timor-Leste is suffering from the effects of El Nino - with a high chance of more to come. In the areas we work in alone, eight communities - 2,187 households - are affected by drought. People have seen their harvests fail, their livestock weaken and water sources dry up. To cope, some families have resorted to skipping meals, abandoning their crops and walking long distances to find water. 7,860 beneficiaries received packets of vegetable seeds - which they planted straightaway. More than 12,800 people received printed information about how to protect themselves against future droughts (including how to protect water sources and store water safely). On December 25, 2016, Typhoon Nock-Ten hit the Philippines with sustained winds of 175 kilometres per hour. Nock-Ten affected four regions of Calabarzon, Mimaropa, Bicol and Eastern Visayas and was one of the strongest typhoons experienced in these provinces for the past decade. Communities were left with damaged houses, overturned vehicles and collapsed power lines. We immediately conducted assessments and held consultations with communities to collect first-hand information. These discussions revealed hygiene kits and other household supplies were a continuing need. and hygiene kits (with soap, toothpaste, sanitary pads and more). 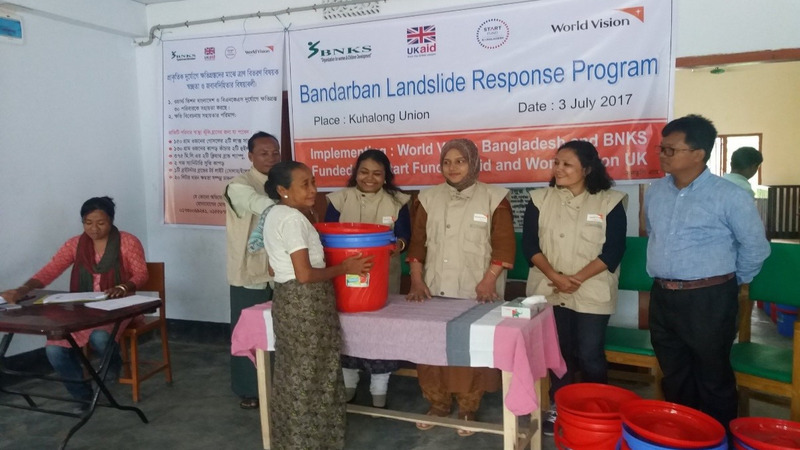 World Vision and ADRA, a local partner, supported the distribution of hygiene kits to more than 1000 people in two locations. 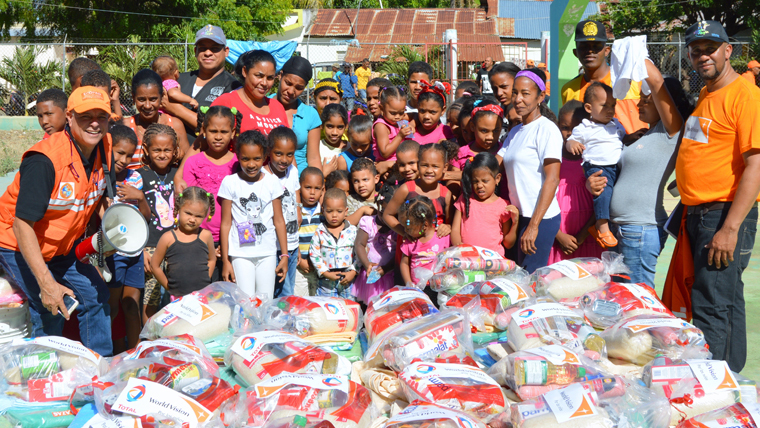 The kits included soap, water purification tablets, mosquito nets and toilet paper. These households also received important information about water, sanitation and disease prevention. After the impact of Hurricane Matthew, some areas of the Dominican Republic saw more than a metre of rainfall in a month. By the end of November 2016, 14,201 people were displaced, 337 people were in official shelters and 40 communities were still inaccessible, with 2,839 houses affected (the Center for Emergency Operations). 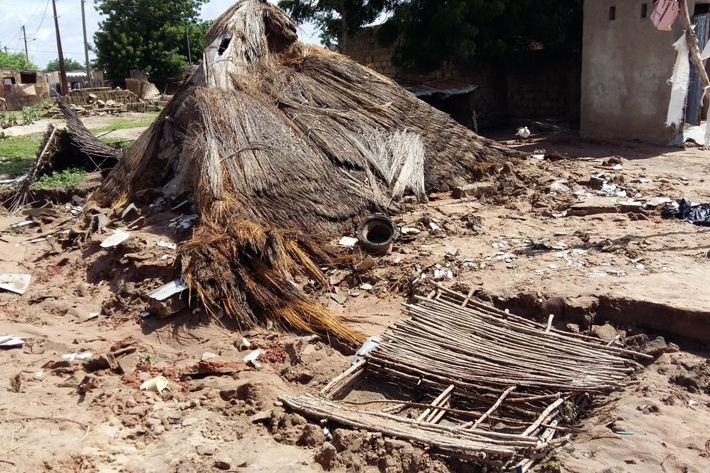 During July 2016 many regions across Senegal received heavy rainfall which led to flooding in areas including Kaffrine, Matam and Kaolack in the central and northern parts of the country, Velingara in the south and recently Dakar. The extensive damage wrought by these devastating rains has affected more than 10,000 people. Families have been driven from their homes and many hectares of fields have been destroyed, threatening harvests, the livelihoods of farmers and the food stocks of a thousand homes. Floods have become more severe in recent years, with emergency events in 2009, 2012 and 2013. Photo: The extensive damage wrought by these devastating rains has affected more than 10,000 people. With support from the Start Fund, we've distributed aid kits (containing soap, a kettle, bleach, liquid detergent, cloths and a basin) to flood victims. Also, 10,000 of the most vulnerable people - those who have lost their homes and means of subsistence - will receive cash assistance to rebuild their homes and lives, and to meet their most urgent needs. Sokhna, whose home was damaged by the floods, described the situation to us: "When the rain started it was 11am and I was in the middle of cooking. My pot was carried away by the waters and the wall of our house fell in. All of my peanut seed was also washed away. We have nothing left to sleep on, and a neighbour has even had to lend me the clothes I'm standing up in. World Vision's health kits are going to come in very handy for keeping us healthy and keeping the children clean and free from disease." The rains reached the village and ravaged the houses, destroying the harvest and our food reserves. 124 huts and houses have been flattened and the electricity poles have been downed. All thanks go to World Vision for intervening because sanitation has become our top priority in this situation. As part of our response we've also been raising awareness of the correct hand washing techniques which are important to protect adults and children from disease, particularly while the remaining standing water increases the risks of cholera and malaria. Mongolia has one of the coldest climates in the world, with temperatures dropping below -40ºC for several months each year accompanied by extremely heavy snowfall. The exceptionally harsh 2015/16 winter has killed livestock and put a strain on thousands of herders across the country. This situation, known locally as a dzud, has affected 225,800 people in 211 districts - the equivalent of 41 per cent of the total herder population in Mongolia. As part of our overall response to the emergency, through the Start Fund, we've helped 2,125 herder families or 8,500 individuals in 15 districts. 675 food packages and 550 animal health kits were distributed. 2,000 handbooks were printed and distributed to herders with traditional and basic methods to care for weak animals, including herbal methods that can be prepared at home and used to protect animals from harsh weather condition and chronic diseases. In November and December 2015, the Indian state of Tamil Nadu saw sustained, heavy rainfall and strong winds. The resulting floods caused landslides and widespread destruction across the region, including the city of Chennai. • roads were blocked and the electricity supply was disrupted. We been worked with families and communities across Cuddalore district, and helped to meet people's immediate needs. We gave relief packs - which included food, hygiene supplies and shelter kits - to 695 of the most vulnerable families (2,501 people). We also looked at vulnerability and resilience; ways to reduce the risks from flooding to people and property in the future. Since 1 October 2014 you've helped us raise over £38,808 for our emergency work. This enables us to be better prepared when emergencies strike, so we can save more lives of children in the world’s hardest places. Since 1 October 2014 you've helped us raise over £38,808 for our general emergency work. Help us to respond to disasters as soon as they strike.